PITTSBURGH (AP) Anthony Rizzo has no intention of easing up at home plate, even after Major League Baseball said he should have been called out for interference when he took out Pittsburgh Pirates catcher Elias Diaz and sparked a debate about what is – and what isn’t – a legal slide. The Cubs then piled on against Pittsburgh’s sagging bullpen to hand the Pirates their ninth loss in 11 games. Chicago scored five times against Pittsburgh relievers, including Ian Happ’s go-ahead double two batters after Rizzo tied it and Kyle Schwarber’s two-run homer off the right-field foul pole in the eighth. Jon Lester (5-2) lacked his usual crispness, allowing four runs in six innings, but had the second multihit game of his 13-year career by going 2 for 3 with an RBI single in the sixth that drew the Cubs within a run. Jason Heyward went 3 for 5 with an RBI for Chicago and got a kick out of the response from fans at PNC Park every time Rizzo stepped into the batter’s box. 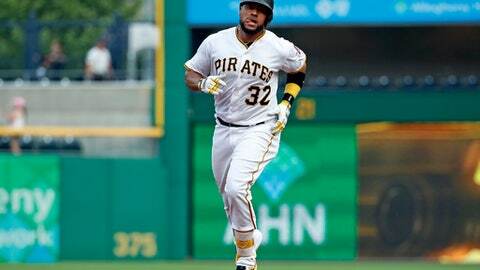 Marte finished 3 for 5 with three RBIs, Austin Meadows hit his fourth home run since being called up on May 18 and Diaz exacted a measure of revenge by taking Lester deep in the third, but Pittsburgh’s bullpen couldn’t keep the Cubs in check after rookie Nick Kingham worked 5 2/3 effective innings while making a spot start for injured Ivan Nova. Rizzo clipped Diaz’s right leg at home plate while breaking up a double play Monday, and Diaz’s throw to first sailed into right field, allowing two runs to score as the Cubs cruised to a 7-0 victory. The play was upheld on replay review Monday but Torre informed both teams Tuesday that Rizzo should have been called out for interference. Cubs manager Joe Maddon mounted a vehement defense for his star, telling Torre he respectfully disagreed with his interpretation. Rizzo stressed he didn’t attempt to injure Diaz and placed part of the blame on a rule that lacks clarity. Rizzo shrugged when asked if he was worried about retaliation, and while the Pirates plunked catcher Willson Contreras twice, they didn’t really take aim at Rizzo until reliever Michael Feliz went tight inside three times in the eighth. Santana hadn’t given up a run in 14 appearances since April 25 but came undone against the heart of Chicago’s lineup. Rizzo’s home run was caught by a fan wearing Cubs gear in the first row of seats above the 21-foot high Clemente Wall. Umpires took a look but the call was upheld after a 93-second review, and Santana fell apart. ”Sometimes the best relationships are formed after some kind of altercation or incidence, whether it’s words or physical,” Rodriguez said. Cubs: Kyle Hendricks (4-3, 3.16 ERA) makes his 12th career start against the Pirates in Wednesday’s series finale.